Oneclick Tag Editor is handy tag editor allows you create, edit, rename audio tags for MP3, OGG, WMA files with just a few mouse clicks. One-click Tag Editor adds tag editor's option to the right-click menu and to the file properties, so you can handle tags of your audio very quickly, without running an application. 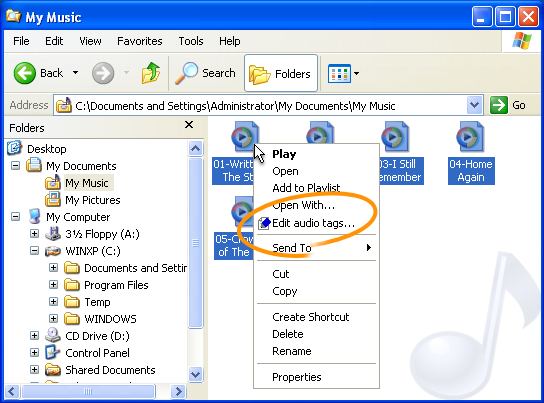 Simply right-click on audio file, group of files or folders and pick "Edit tags" to edit any field of tag instantly. ...... You may enable autocompletion for each field of tag to let tag editor predict the word you want to enter if you've been entering it before, for example artist name you often use. One-click Tag Editor supports both ID3v1 and IDv2 MP3 tags, it can handle not just MP3 tags but also tags for WMA and OGG audio. One-click Tag Editor can also rename your audio files according to their tags. You may choose the renaming pattern you want (for example "Artist - Album - Title.mp3") or create your own. Qweas is providing links to Oneclick Tag Editor 1.21 as a courtesy, and makes no representations regarding Oneclick Tag Editor or any other applications or any information related thereto. Any questions, complaints or claims regarding this application Oneclick Tag Editor 1.21 must be directed to the appropriate software vendor. You may click the publisher link of Oneclick Tag Editor on the top of this page to get more details about the vendor.